In the upcoming Apache Camel 2.9 we have improved the support for splitting big XML files using streaming and very low memory footprint. In previous versions and examples provided on the Camel website, often showed examples of using XPath to split XML files using the Splitter EIP pattern. Unfortunately the underlying XPath framework do not support an iterator based result, as its limited to the types defined by the JDK in the XPathConstants. That means a NODESET would be used as result type, which causes the XPath framework to return a NodeList instance which contains the entire XML payload in memory. There is nothing you can do about this despite using StAXSource, SAXSource or other stream types as input to the XPathExpression. Regardless what it would return a NodeList as result. The pair mode is to be used when you need to grab piece by piece and you have a known start and end tokens to denote a record. For example if you have a [START] and [END] markers in the content. What I like about the tokenizer is fully stream based and returns data as String content, which means there is no intermediate DOM or POJO objects or anything like that. Which mean it can split any kind of XML payload without having any model of it in the java code. So if you just need as in these examples to split the big XML file and send each splitted message to a JMS queue, then that is fast as there is no unnecessary to/from object marshaling. I ran a little test on my laptop to process 40.000 records and the memory usage delta was about 4mb. Running the same test with XPath reneders a memory usage delta about 100mb. The reason is that after all content is loaded into memory, then its a pure CPU processing, where as the tokenizer does load the content from disk piece by piece. That was just a small XML file with 40.000 records with a file size of about 7mb. Now image if the XML file was a 500mb size with a million records. The XPath will be very slow and most likely cause a OOME exception on your server. The unit tests is in camel-core which you can play with in the src/test/org/apache/camel/language directory. Its a community effort together with Romain who have created a Camel StAX component with a stream based iterator as well. However it requires a POJO model that has been JAXB annotation to be used. 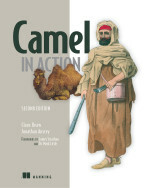 We will continue working on this and have his work contributed into the Apache Camel distribution. Great! Is this available in 2.9.0-RC1? I can't seem to find it. No its added after the RC1 release. We are actually cutting the 2.9.0 GA release today. Then Apache has a voting period, where you can download the RC of the GA and give it a spin. And if no issues found during the vote period, its graced as a GA release. Otherwise keep eye on the Apache site as we will announce when the 2.9 is GA. And I most likely will blog about that as well. Oh and I wrote a part-2 blog entry as well. As we have another way of splitting big XML files. Ok, thanks. Looking forward to the new release! when I was trying to split a big xml file using split().tokenizeXML("child", "parent").streaming() I encountered a strange problem by chance. I want my child tag to inherit parent's namespaces. When the parent has multiple namespace declarations and when these declarations are separated by newlines child cannot inherit namespaces. When they are on the same line it works fine. Its in the issue tracker you report bugs. yep, I will do so. thanks for your help. but the code will not compile. At least not in 2.9.2; there is no body().tokenizeXML()? Thanks for this very useful post! I had question, is there a way we can catch/handle a scenario where in the the tag given in the tokenizer is not in the file which Camel is trying to split? The file in example can be an XML file. I tries to search in the forums, but couldnt find anything. Will appreciate your input and advice in this. Thanks for looking at my post. I am using file size 1.8 MB(1842 KB) and total records in file are 10400 and running in JBoss Fuse (camel context). After enabling streaming there is no change in test results. Can you shed some light on this issue? Developed a process in JBoss Fuse (Camel context) using split, tokenize and sql insert (parameterized sql). There is no significant change even after enabling streaming. Can you please shed some light to improve the performance. After enabling the option 'streaming' there is no significant change in processing time. But after enabling the option 'Parallel processing', the processing time reduced significantly to less than 1 min (30 - 45 seconds). Please advice if any other best practices.